July 6, 2010—If you’re interested in growing your own food, you might want to consider eggs from your own chickens too. Community Crops, which has for years coordinated community gardens and offered classes on gardening and cooking, has a new class on urban chickens. Chicks can be purchased in any number through local farm supply stores for $2.50—$3.00 each. Chick season is April 1 through June 1. It is recommended to buy a pair at the same time. If introducing a new chicken to your backyard coop, make sure it is about the same age as your current chicken and use fencing to keep it isolated. Only after they have become familiar with each other, allow them in the same coop. Chicks arrive for purchase at local farm stores inoculated. Thereafter, they are fed medicated Chick Starter until they are sold. If your goal is to raise chickens without antibiotics make sure to purchase grain mixtures without the word “medicated” on the bag. According to Community Crops, chicks should be kept in a small space when very young, which should gradually increase as they grow. A heat source such as a 100-watt light bulb or an infrared reptile heat bulb is needed to keep them warm. Chicks’ downy fluff will be replaced with feathers in about two months. At this time, they can begin eating grower food (~17% protein). In two more months, they can switch to a slightly lower protein layer feed. Doug Karsting, who lives in central Lincoln, got his first chickens seven years ago as a Peace Corps volunteer in Africa and has been raising them ever since. Mature chickens are relatively inexpensive and easy to care for. The biggest expense is housing. However, resourceful chicken owners can salvage materials or buy them at building material reuse stores like Ecostores Nebraska located at 530 W. P Street. 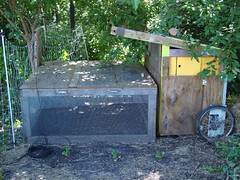 Karsting turned a used shipping crate into a chicken shed. Other requirements for the coop that can be fashioned out of repurposed materials are a nest box, roost (1 foot per bird), feeder and a waterer that won’t tip over. Karsting’s costs included a heat lamp for winter and chicken wire—roughly $50. And even though chickens are easy to care for, they are not maintenance free. They require daily food and fresh water. The coop must be cleaned and the chickens inspected regularly to ensure they are healthy. Of course, the eggs must also be collected daily. Karstings estimates the time involved for chicken chores to be 20 minutes a day for food and fresh water, 45 minutes a week to clean the coop. The payoff, of course, is fresh eggs, which will have a darker color yolk and a more robust taste than what you can generally buy at the store. Eggs purchased in the grocery store are usually a couple of weeks old. The average laying hen will produce up to 300 eggs a year although production depends on the breed, age of the chicken and the environment. Karstings feeds his chickens table scraps and vegetable scraps. “Chickens love grass clippings. We throw some in the coop after mowing the lawn as a special treat,” says Karstings, “With chickens you hardly ever waste food.” He also supplements their diet with commercial layer mash and oyster shells, which can be bought in 40-pound bags for about $8. Chickens will do a good job of supplementing their diet with grass, small rocks, bugs, weeds, seeds, and even the occasional small mammal such as mice. Beyond the economics, raising chickens allows for more control over the quality of your eggs. Everyone will enjoy the benefits urban chickens have on a city, including increased access to healthy foods, family/community bonding, connecting children with nature and economic savings. Even if you don’t have your own urban chickens or urban garden, you can support those who do. Visit www.lincolngreenbydesign.com for a list of local farmers markets. For chicken information and support see Community Crops informational handout and classes on their website, www.communitycrops.org. also LincolnGreenScene.com Urban Chickens group. Backyard chicken coops can be made by repurposing a variety of objects including shipping crates, cabinets, dog houses and found lumber. This example belongs to Amy Brt, Community Crops community garden program manager. 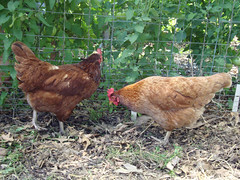 These Rhode Island Reds belong to Leslie Pillen, Community Crops farm manager. This breed of chicken is popular due to its resistance to illness, egg laying ability and docile temperament. 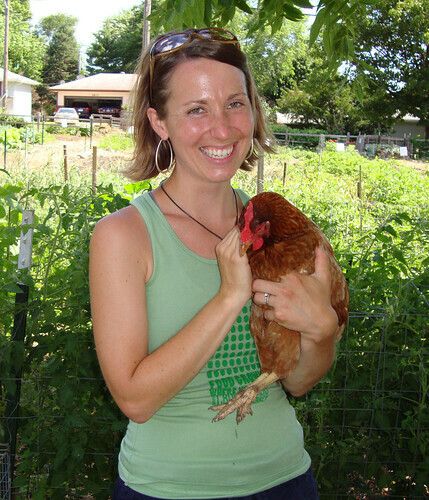 Leslie Pillen, Community Crops farm manager holds one of her chickens, Big Bird, a Rhode Island Red. Thanks to Christine Hunt for assistance with this article.